Brotherly 愛 :). . Wallpaper and background images in the Damon and Stefan Salvatore club tagged: damon stefan ian somerhalder salvatore vampires brothers the vampire diaries paul wesley. 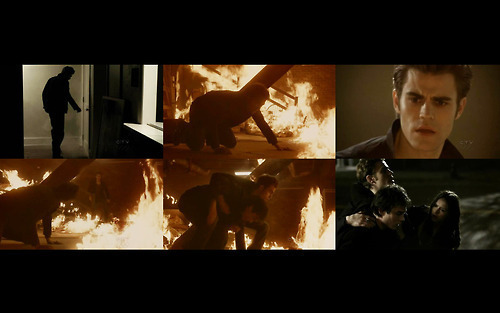 This Damon and Stefan Salvatore fan art contains 火, 炎, 地獄, インフェルノ, 火災, 火, 暖炉, 炉, and 囲炉裏. There might also be 看板, ポスター, テキスト, 黒板, サイン, 夕日日の出, 日の入り, 日の出, ファミリールーム, and ファミリー ・ ルーム.